On March 5-8, 2008, the Salmonid Restoration Federation (SRF) hosted their annual meeting in Lodi, California. This years conference included talks about the central valley of California, where water diversions have left many once-great rivers bone dry, and the once-vast wetlands of the San Francisco Bay-Delta are on the brink of ecological collapse. Most of the dams here are destined to stay in place for the forseeable future, and complex work-arounds are being considered to restore water where there is none, without removing the existing infrastructure. As a speaker in the dam removal panel, however, I felt privileged to learn of the latest developments on the cutting edge of a new era in river restoration. To anyone who has played with water as a kid (or adult), there is nothing more alluring than the concept of removing a dam. Large or small, it's something we can all relate to - a river is either free-flowing or it's not. But the actual transition from a river blocked by a dam and decades worth of sediment, to one that runs free, is a technical and scientific frontier. This has been done only a handful of times, and at relatively small scales. The crux of the issue in removing a dam is not concrete demolition. It's sediment management. The nature of that sediment, and more importantly how we have treated the river downstream, dictate how a dam may be removed. 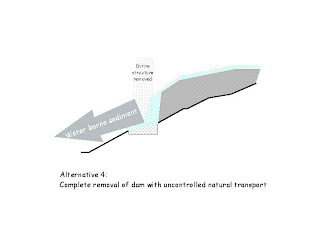 MECHANICAL TRANSPORT: If the material trapped behind a dam is contaminated, in the case of a mine for instance, it may not be released downstream, but rather must be removed by mechanical means. Think trucks. Lots of trucks, or perhaps a conveyor. 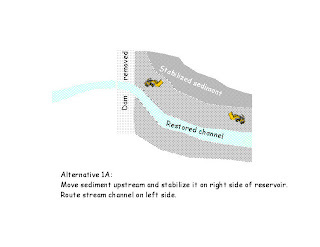 STABILIZE IN PLACE: In cases where development has encroached on the downstream floodplain, and mechanical transport may be cost prohibitive or infeasible due to the sheer volume, or lack of roads, creating a channel and stabilizing the sediment upstream may make sense. NATURAL TRANSPORT is the method that really tweaks the imagination. "Blow and Go" makes sense when there is no downstream risk, but until recently this has not been done on a very large scale. The panel of experts presented cases in which each of these methods has been used, or is being planned. But the highlight of the discussion at SRF was a presentation by Gordon Grant on Marmot Dam. Last October, this 50 foot dam on the Sandy River in Oregon was removed. A coffer dam was placed upstream to temporarily divert the river while the concrete was being blasted, then the river was allowed to do the work.